Kumu Hina Documentary – It’s Stunning!!! The film itself was glorious. Personally, I was in heaven as it combined two of my top passions – Hawaiian culture (and activism) and support for gender variant people. 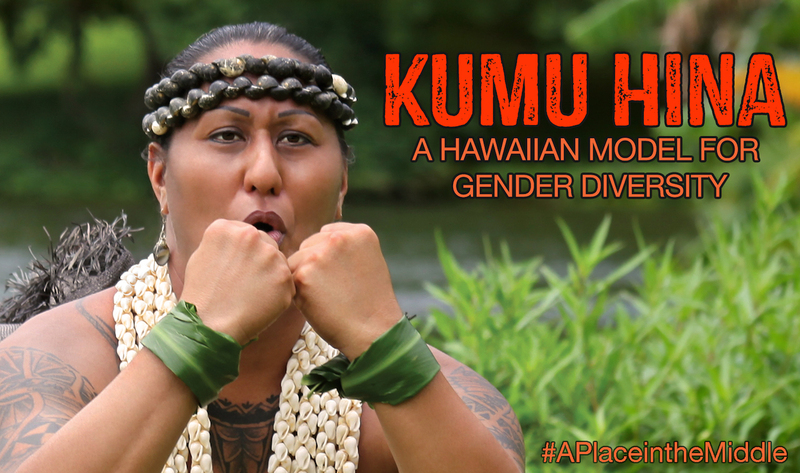 And, as the mother of two, including a recent college graduate who just happens to be a trans guy, the portrayal of Ho’onani, one of Kumu Hina’s young students, was very meaningful. The fact that this kid was able to take her “place in the middle” with the full support of her teacher (and perhaps the somewhat more cautious permission of her family) was outstanding. Honestly, this is so rare in the world! Ho’onani is not the only “in the middle” kid Kumu Hina has taught, but her story and presence was especially compelling. Of course, opportunities for examination of all kinds of intersectionality abound in this film. And though this blog is not meant to be a film review as much as it is a tale of my experiencing of the film, I can’t avoid mentioning some of them. For one thing, though my heart was wide open, I was watching with non-Hawaiian eyes. And I had many lenses over these eyes: sexologist lens, parent of a trans person lens, former hula student lens, Hawaiian independence ally lens, partner of an elder Hawaiian independence activist and cultural practitioner lens, hapless citizen of the country occupying Hawai’i lens, younger partner of somewhat older person lens, feminist lens, settler-colonist of Turtle Island lens, and so on. Different parts of the film resonated with me on different levels and in different ways, while at other times I was aware of how profoundly different my life is from the experiences of the people in the film. When Ho’onani opened up her voice and spirit and chanted, I was remembering how my oldest kid, as an eleven-year-old hula student, also used to chant with an intense spirit and voice. Watching the footage of rural Kaua’i, I hearken back to a certain off-grid plot of land in Waimea on Hawai’i island, where wild pigs, sheep, and dogs sometimes have roamed together. I also commiserated with the difficulties of long-distance relationships. And when I came home late last night from the reception which followed the screening, I found a large pile of dishes in the sink – left for me to clean. So I recalled scenes from the film where Kumu Hina, an accomplished professional woman, copes at the end of the day with dinner and cleaning while her husband watches television. Her remarks about Polynesian men hit home too – and I responded to them as someone who has sometimes clashed with my (long-distance) Polynesian partner over issues which seem crystal clear to me as a white, feminist, urban Californian, but are far deeper and much more complex when taking so many other issues – and a whole other human being with a different genealogy and culture – into account. Cultural clashes, intersections, and complexities are inevitable and not all binary, in spite of how I have written them here. In the Kumu Hina film there are many opportunities to explore elements which are either explicit or implicit (or both!) and which rub up against each other in various ways, causing sensations of pleasure, confusion, inspiration, or pain: in front of the camera/behind the camera; love/struggle; male/female; rural/urban; American/Hawaiian; gender conforming/gender variant; colonizer/colonized; compliant/resistant; commodified/authentic; educated/less educated; younger/older; professional/working class; this island/that island; student/teacher; parent/child; conservative/progressive; and so on. And yet the main message of this film – kept real by Hinaleimoana Wong-Kalu’s honesty, integrity, and groundedness – was not just the explicit message of aloha (the deeper kind, not the touristy interpretation), but also an implicit one of teachability. The film seemed to trust that most of us who watched it (as well as those who were involved in the making and living of it) could and would experience many layers of learning through the film – learning which would lead us with more hopeful certainty to the possibility of understanding and experiencing aloha. The rest of us who only knew of her, rather than knowing her personally, joined the standing ovations she and the film deserved. And I’m hoping some of us at least will also give to the film’s Kickstarter campaign (they’re trying to raise $10,000 and are about $7,000 short) and to Hinaleimoana Wong-Kalu’s OHA election campaign fund. OHA stands for “Office of Hawaiian Affairs” and she is running for election as a trustee. I am also hoping that Halau Lokahi, the Hawaiian charter school where Kumu Hina teaches, will survive its current troubles. You can sign a petition supporting the school here and donate at the above link. These schools are super important for Kanaka Maoli (Native Hawaiian) kids, and deserve our support.